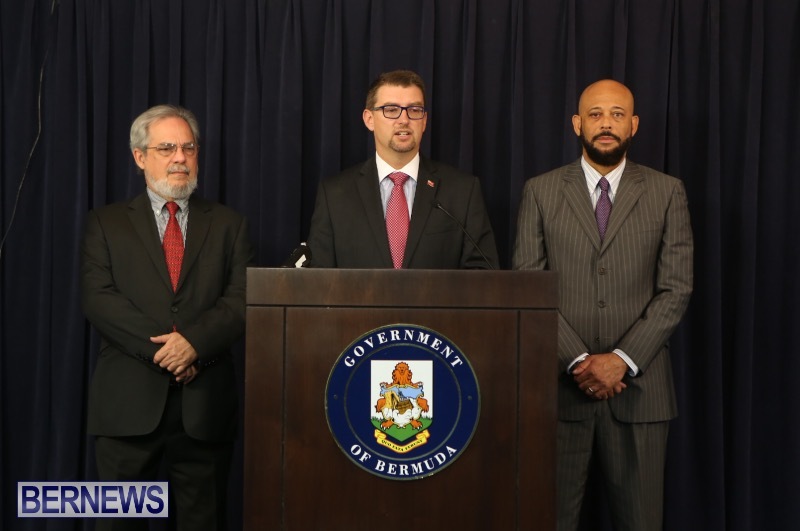 [Updated with video] The Government plans to make changes to the law to provide pathways to Permanent Residency and Bermuda status for some long-term residents, Minister of Home Affairs Michael Fahy announced today. The Minister said they will amend the Bermuda Immigration and Protection Act 1956, with changes to include any person who is ordinarily resident in Bermuda for 15 years becoming eligible to apply for permanent residency, and any permanent resident who is ordinarily resident in Bermuda for 20 years becoming eligible to apply for Bermudian status. In addition, adoptive children of Bermudians in Bermuda can automatically obtain status if they meet certain conditions; any person who was born in Bermuda, or who arrived before his or her 16th birthday, will be eligible for permanent residency after ten years of ordinary residency in Bermuda upon reaching their 18th birthday; and any person who has a “Bermuda immediate family connection” will be eligible for permanent residency after ten years of ordinary residency in Bermuda upon reaching their 18th birthday. Minister Fahy said, “The unfortunate reality is that Bermuda’s immigration policy has allowed substantial numbers of people to live in Bermuda with no real hope or expectation that they can ever achieve the full rights associated with being Bermudian. “In terms of providing pathways for Bermuda Status, the main reforms we are proposing will allow any permanent resident who is ordinarily resident in Bermuda for 20 years to apply for Bermudian status. Good afternoon,Today I am here to announce that Government will seek to introduce new pathways to permanent residency and Bermuda status. This will advance human rights in our island to bring us in line with important international human rights standards. These amendments will be contained in the Bermuda Immigration and Protection Amendment Act 2016 which Government intends to table in the House of Assembly in the coming weeks. First, let me just acknowledge the presence of my Junior Minister, MP Sylvan Richards. I also acknowledge the presence of my colleague, the Attorney General, the Hon. Trevor Moniz, JP, MP. He has rendered much assistance to our team in respect of the policy initiative I am about to announce. This announcement today should finally bring the much-needed security and peace of mind to those in our community who have come to call Bermuda their home but yet, legally, are viewed as outside guests here. These people wake up day-to-day filled with uncertainty and anxiety; they do not know what Bermuda holds for them in the future. These are our neighbors and friends – people who have put years of hard work and dedication to build Bermuda up. Their children were born and raised here, and some of them were even born here themselves. They provide jobs for Bermudians; they eat at our restaurants; they rent our homes; they tend to our sick; they walk the beat and protect us; they volunteer their services to charities. They love Bermuda just as much as we do. I want to begin by stating something which I find to be quite shocking…Bermuda is one of the only places in the world that does not have a pathway to status that isn’t through marriage. Let me repeat that: Bermuda is one of the only places in the world that does not have any pathways to status. Turks and Caicos is the only other British Overseas Territory which does not have a pathway for ‘belonger’ status. Many other small jurisdictions, like Bermuda, also provide such pathways: Anguilla allows for permanent residency after 7 years and ‘belonger’ status after 15 years; the Falklands allow for ‘belonger’ status after 7 years; the British Virgin Islands allow for ‘belonger status after 21 years. Other small island and Caribbean jurisdictions allow for citizenship from as little as 5 years to as much as 25, with most averaging in the 8 to 10 year range. The unfortunate reality is that Bermuda’s immigration policy has allowed substantial numbers of people to live in Bermuda with no real hope or expectation that they can ever achieve the full rights associated with being Bermudian. Likewise, permanent residents are growing up and having children of their own, and to these children, Bermuda is their only home; they know no other place. The plight of people affected by our current restrictive immigration policy is a longstanding problem faced by successive Governments. There was a time when the grant of Bermuda status was discretionary. This was done away with in 1989. Under the OBA Government, we will never go back to a system of discretionary grant of status. Our legislation minimizes the opportunity for ministerial discretion and for ministerial abuse. The removal of those provisions led to increasing numbers of persons for whom Bermuda is home without any legal right to Bermuda status. This is contrary to international law. Past immigration policy has involved periodic amnesties for the grant of Bermudian status. The UBP Government enacted amendments in 1994 which allowed for those born in Bermuda or who arrived before their 6th birthday to make an application upon turning 18 and before 2008. This legislation introduced a moratorium aimed at ‘taking a pause’ in respect of immigration policy. In 1998, the Government then introduced the possibility of working resident certificates which amounted to a form of conditional residency for persons who continued to be employed in Bermuda. This did not, however, meet baseline international standards. During its final years in office, the UBP was never able to come to a fair, sustainable solution to the question of Bermudian status. As time went on, more and more people were setting down roots in Bermuda with no solution in sight. At the end of 1998, the PLP took power. However, in their 14 years at the helm, they too failed to properly address the issue of Bermudian status. In 2002, the Government introduced limited rights to apply for Bermudian status and allowed long-term residents to apply for permanent resident certificates or PRCs. The number of persons eligible for Bermuda status was very small. Instead, most long-term residents were caught by the PRC provisions. Permanent residency was available to non-Bermudians with over 20 years of continuous residence and demonstrated good character and conduct. These persons also had to be ordinarily resident in Bermuda before August 1, 1989 and be at least 40 years old on the date of application. A secondary group of non-Bermudians could apply for permanent residency if they were closely related to Bermudians and other permanent residents. My Honourable Colleague, the Attorney General, would be intimately familiar with the history I’ve just relayed and the issues underlying these fits of reforms. Members of the public will undoubtedly recall his participation in various grassroots efforts to reform the law in a previous time and while wearing a different hat. It is for that reason he is joining me here today, and he has been a tremendous help in bringing this policy to fruition. During this time and as a complementary policy initiative, the PLP put in place term limits for non-Bermudians. I have previously spoken about how ineffective this policy was for protecting jobs for Bermudians. The reality is that extensions of term limits were regularly given – in excess of 70% of people who applied for waivers of term limits were granted such waivers. The highest number of work permits ever processed happened under a PLP Government in 2008: 8,699 permits to be exact. [For comparison, 4,207 work permits were processed in 2013.] This directly contributed to the policy issues we are facing now with long-term residents in Bermuda. I would be remiss if I failed to mention efforts by the previous Government when it enacted the Incentives for Job Makers Act 2011. Immigration legislation was amended to allow senior executives who help create jobs for Bermudians and who have been exempt from immigration provisions regarding work permits for at least 10 years to obtain permanent residency. While efforts to attract investment to Bermuda should always be lauded, in the Government’s view, an immigration policy which fails to address private and family life categories of immigration is an incomplete one. This Government made a commitment in its November 2013 Throne Speech to undertake a review of immigration law and to look to create certain new pathways for Status. As my Ministry began to look into the matter further and as more cases of hardship caused by the laws currently in place came to my attention, it became apparent that more fundamental reform was needed. Many decisions of the Immigration Appeal Tribunal, all of which are published on the Department of Immigration website represented further interventions requiring a policy response from Government. Taken together, it became clear that the Government needed to come forward with more fundamental reform, a position we note with which the Opposition agrees. Then came the Supreme Court decision of Carne and Correia. That case gave us a ruling by the Chief Justice clarifying the fact that permanent residents who were ordinarily resident in Bermuda on or before July 31st, 1989 could apply for Bermudian status. It was always Government’s preference to  address the question of persons born in Bermuda or who arrived at a young age,  to mitigate the unfairness of different individuals in the same family obtaining Bermudian status,  to clarify the circumstances when children adopted by Bermudians could obtain Bermudian status, and  to avoid a growing crisis of potential statelessness of non-Bermudians born and living in Bermuda. The fact is that we have been overtaken by events. The Chief Justice’s decision in Carne and Correia represented yet another factor which had to be taken into consideration when crafting our policy. To summarize from this short history, the following are the recurring themes of immigration policy in Bermuda:  stop-gap measures that fail to produce long-term, sustainable solutions;  work permit practices which lead to large pools of non-Bermudians in limbo;  a bipartisan understanding of the need to attract international business to Bermuda but a corresponding failure to address the private and family life aspect of immigration policy; and  a failure to abide by baseline international human rights standards, including those standards in other small-island jurisdictions which are comparable to, and competing with, Bermuda. The status quo is totally unacceptable. This is especially the case in a jurisdiction as modern and progressive as Bermuda.The status quo has led Bermuda to fall afoul of its international legal and human rights obligations under the European Convention on Human Rights and the International Covenant on Civil and Political Rights. Blanket bans on obtaining such residency rights , as is the case currently, are not consistent with the European Convention on Human Rights. Currently, permanent residency is available to senior executives who are ‘job-makers’ and who have been exempt from immigration provisions regarding work permits for at least 10 years. It is also available to an ever-shrinking class of persons who are the adult children and spouses of other permanent residents who in turn were in Bermuda on or before 31st July 1989. There are no other pathways for long-term residents or family members to obtain permanent residency. In our opinion, an immigration policy that offers no pathway for long-term residency or for protection of private and family life is incomplete, unfair and frankly – wrong. Where an applicant is a permanent resident and has lived in Bermuda ordinarily since at least 31st July 1989. 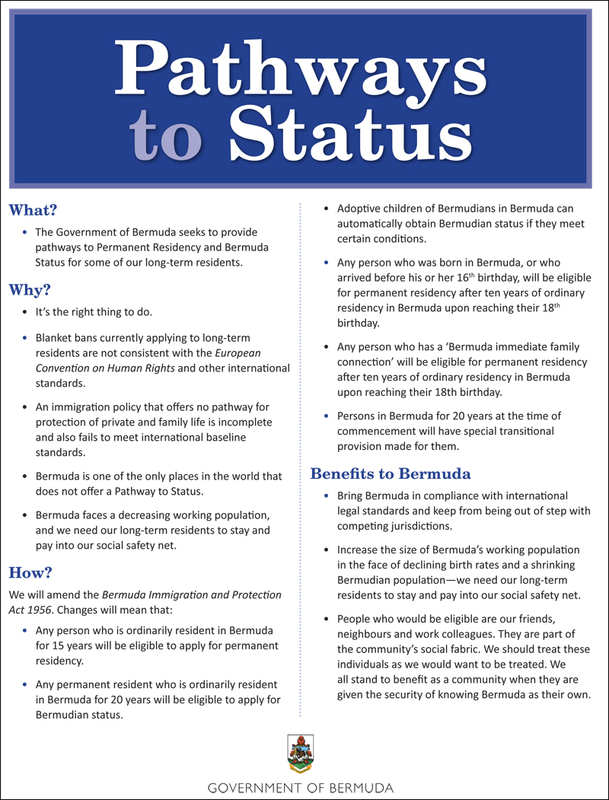 In terms of providing pathways for Bermuda Status, the main reforms we are proposing will allow any permanent resident who is ordinarily resident in Bermuda for 20 years to apply for Bermudian status. In addition, such a person will need to be a Commonwealth citizen, must be of good conduct and character throughout the period of residency in Bermuda and must not be convicted of offences showing moral turpitude, as has always been the case. The legislation will make special, transitional provision for those who are already in Bermuda for 20 years or more upon commencement, provided they are Commonwealth Citizens. The legislation will also correct what – in the Government’s opinion – has been a grave problem with the legislation in respect of the adoption of children by Bermudians. Traditionally, such individuals were only deemed to be Bermudian until their 22nd birthday. They would then have to make an application for the grant of Bermuda Status when they turn 18 and would have to have ordinarily lived in Bermuda for five years before that application. However, this leaves such children vulnerable to losing their chance for Bermudian status if that five year residency period is interrupted. The law also makes an unfair distinction between the natural born children of Bermudians and those who are adopted by Bermudians. (4) the adoption is recognized under the laws of Bermuda. This will therefore mirror the current legislative provisions in respect of those who obtain Bermudian status by birth. An adoption effected by the courts of Bermuda will lead to status for the child as from the date of the adoption order. An adoption from overseas will require that a General Inquiry be made to the Department of Immigration supported by an affidavit of domicile before the child can be registered as Bermudian. Any person who is ordinarily resident in Bermuda for 15 years will be eligible to apply for permanent residency. In addition, such a person will need to be resident in Bermuda for two years immediately prior to his or her application and must have been a person of good conduct and character throughout the period of residency in Bermuda. Also, any person who was born in Bermuda, or who arrived before his or her 16th birthday, will be eligible for permanent residency after 10 years of ordinary residency in Bermuda upon reaching their 18th birthday. In addition, such a person will need to be resident in Bermuda for two years immediately prior to his or her application and must have been a person of good conduct and character throughout the period of residency in Bermuda. the spouse of a permanent resident where that spouse does not qualify for such grant or for the grant of Bermudian status. In addition, such a person will need to be resident in Bermuda for two years immediately prior to his or her application and must have been a person of good conduct and character throughout the period of residency in Bermuda. These permanent residency ‘family’ provisions were introduced by the then PLP Government in 2002. The major change being introduced is to remove the 2010 time limit for making an application. It should be noted that there will be circumstances where the Minister for Immigration will have the right to deny an application for permanent residency or Status. For example, where a potential applicant does not meet the residency requirements or where any period of absence from Bermuda has not been authorized. This would not include work or education-related absences. The Minister will have to consider all factors of a person’s presence in Bermuda to consider whether he or she has been ordinarily resident, as has always been the case. In addition, no applicant will be successful if they have been convicted, whether in Bermuda or elsewhere, of offences showing moral turpitude, or their character or conduct otherwise should disqualify them from a grant of Bermudian status. Finally, the amendments will clarify that the Minister will have the power to strip anyone of Bermudian Status or permanent residency following any application which was obtained by means of fraud, false representation or the concealment of any material fact. Apart from the fact that making these changes is simply the right thing to do and is long overdue, it almost goes without saying that there will be numerous benefits to Bermuda as a result of this Legislation. Firstly, it will help to increase the size of Bermuda’s working population in the face of declining birth rates and a shrinking Bermudian population; it is no secret that Bermuda faces real demographic challenges in the coming years. The reality is that we have many more Bermudians who are getting older and fewer younger Bermudians who are able to pay into our social insurance, pension and health insurance systems. Our non-Bermudian population is far younger; those who are ideally placed to benefit Bermuda in the long run are those who have already demonstrated their commitment to Bermuda through their long term presence. As Bermudians begin to retire, they will appreciate the presence of younger workers who ensure that our social safety net continues to be affordable. There are other very pragmatic, immediate benefits. New applications will represent a revenue-enhancing opportunity as applicants pay the substantial fees involved under the legislation. New Bermudians, with their newfound security, could seek to purchase real estate or inject capital into Bermuda companies as directors and shareholders. Assets which will be earmarked to leave Bermuda will be more readily available for investments in the local economy. These contribute to an economic multiplier effect and feeds back into positive movement in Bermuda balance of payments and increased Government revenue. There are some who will say that acting to provide Pathways for residency and status will take jobs away from Bermudians. This will not happen. We are dealing with very small numbers of persons who may qualify. The 2010 Census data revealed a total work permit population of 6,421. Of that, 5,738 had been in Bermuda for less than 15 years. 511 have been in Bermuda for 15 years or more. Assuming that the 172 who did not report were in the latter category, we are dealing with at most 683 possible applicants likely to be able to make applications upon this legislation coming into operation. The Census data is now almost 6 years out of date. With work permit processing cut in half since 2010, many of these work permits holders will have long since left Bermuda. Very fewer numbers will likely qualify in the coming years if and when the proposed legislation is enacted. The Department of Immigration estimated that 1,455 PRCs were potentially able to apply for Bermudian status following Carne and Correia. Just over 760 have submitted applications. With a take up rate of just over 50%, we believe that not all work permit holders would rush to submit their applications upon enactment of the legislation. The Ministry of Home Affairs, through the efforts of the Department or Workforce Development, is ensuring that Bermudians are retooling and retraining for the jobs of today and tomorrow. In contrast to the Opposition on work permits who talked tough and hoped that no one would notice the flimsy record underneath that rhetoric, the OBA Government is tough in ensuring that Bermudians come first in our employment market. However, more important than the economic imperative, I hope the Bermuda public will agree that this is the humanitarian and right thing to do. I have spoken already about the need to bring us in line with international baseline standards seen in other jurisdictions and established in international law and I have spent some time with various representatives of community organisations and have heard the issues that exist. Many individual commentators out in the community would undoubtedly and sadly like to paint these reforms as “anti-Bermudian”. There is nothing anti-Bermudian about helping our family, our friends and our neighbours. The people we are talking about represent every class, race, ethnicity and national origin. Like the Good Samaritan tending to the needs of his neighbor, we Bermudians are kind and compassionate. We are our brother’s keeper. We all have an interest in making sure that the links we have with people fully enmeshed in the community are maintained. I am sure that everyone out there in the community will know of someone who has been adversely affected by a lack of protection in our immigration policy. You would be shocked to hear from the people that I have heard from since becoming the Minister responsible for Immigration. I hope to share some of these stories in the coming weeks, like the 34 year old nurse who came to Bermuda from Jamaica at age 7 who is on a work permit with no rights despite being here in Bermuda for 27 years; or the young man who came to Bermuda at age 7 from the Azores and is now in his late 30’s but lost out on status because of a two year absence from Bermuda due to a family illness; or the dozens of others who obtained PRC under the previous Government but who now essentially have stateless children. I recognize that there will be those among us who may have questions or concerns and I certainly welcome any frank and open discussions from those individuals in the weeks to come. I have provided a short guide on the effect of the proposed changes to the legislation which I hope everyone will read. I urge everyone to engage in constructive dialogue in respect of these important changes and not engage in fear mongering or misinformation campaigns. We are not talking about “opening floodgates”. We are talking about what is the right thing to do and I believe these changes should accordingly be fully embraced. Clearly not out of an altruistic intent, but to increase the OBA voters for the next election. I am sure they know that they have angered the PLP loyalists who stayed home last election and who will certainly come out to vote this election and consequently the OBA will lose unless they can get in some new OBA voters in the mix. & yet they’re still winning at the polls, go figure.. The PLP never lost that seat, so is it technically still “winning” ? @ inna: Well tell me this, had they of not won last night would it not of counted as a loss??? It would have been a loss, it also would have a lot more than just winning again. With all due respect, that is utter nonsense. This country needs more people living here and pumping money into the economy. Have you not noticed how quiet it has become over the past 7-8 years? Nowhere in this report do I see “it will be restricted to white people”. I would assume that a black man from Barbados who has spent 15+ years of his life working in Bermuda would be as entitled to status as a white man from Liverpool who has done the same. Smh, we did not drive out expats, the global recession and its impact upon Bermuda did. Please stop with the dishonest UBP/OBA talking points. And the results of the recent bye election indicated fewer and fewer black Bermudians are now prepared to by that narrative. For real…Theses companies are still consolidating today and shedding employees…But that doesn’t sound as juicy! Can we start with the 1000′s of Bermudians who have fled? Oh rite, those aren’t the ones you want are they? Do you have census and/or other data that supports your claim of the “thousands” of Bermudians who have fled? You are the one who doesn’t get it. More people = more money is a fallacy that had dire consequences on countries that have tried this theory. More wealthy people who don’t send most of their earnings back home means more money. Despite what people think PLP was doing to help Bermudians they weren’t. PLP are the ones who started driving out the wealthy but they didn’t decrease the flow of work permits in documented fact work permits were at the all time highest under PLP. Those granted work permits under UBP were majority wealthy and under PLP were majority low income. OBA continues the trend that PLP started because those they listen to want cheap labor that doesn’t care they are getting paid less since it still converts to a lot more when sent home. Under PLP and OBA many millions annually have left the country. Those who keep saying UBP/OBA have their blinders on as it’s more so PLP/OBA just OBA has been more forward with what they are doing than PLP. If PLP were really for Bermudians they would come clean and admit that those before them help their foreign friends and family displace Bermudians and now OBA is following suite. Come on PLP tell the truth and shame the devil. Admit it PLP, you started the fire that OBA is stoking. I have lost all hope with party politics. We need UK to step in and govern us before we sink. How is it to generate more jobs when these people are already here & have been here for 20+ years, are they not already employed? So your argument is weak. @ Interactive The official Bermuda population in 2008 (to reach back the 8 years you mention) was 65,273 the present official population is stated at 65,024 so there’s a difference of only 249 people. Now factor in that the time period you want to reference was also while Bermuda was just reaching the end of its’ largest economic boom in Bermuda’s entire history. So really that population was inflated to reflect the amount of cash that was flowing through the island at that given time. If you want a true reflection of Bermuda’s population then average the population over the past 20 years & you would see we’re presently still well above average. If the present population was fully employed yet the economic growth still wasn’t attainable I would see your point but there are plenty of Bermudians under or not employed so really we’re not fully utilizing the resources we already have. You say we need to increase out population & that this is the way to do it but how do you figure? We’re talking about people who have been here 20+ years & have been employed already during this time, we’re not talking about importing people to increase the population figures. This takes the word Sore Loser to a whole nother level !!!!!!!!!!!!!!!!!!!!!!!!!!!!!!! Clearly you only see one side. There is no one who wants to close any doors on debate in this matter. If it were held as a referendum do you think what is on the table would lose? What if it went to the European Human Rights Court? Do ou think you would win? You have held these few people in a declining population to ransom. Do you as a minority to fairness now want to be empowered to select who you chose to have status? Do you as a minority want to deter investment in this country and destroy trust that we can create a good environment for people to come into Bermuda and put down long term investment? Do you as I would hope a Bermudian also think that the outside world would want to negotiate with you? Do you as a Bermudian think that as long as we are paid in Bermuda $ we are okay? Are we okay to teach our children that we re divided and it is all some one elses fault? Passionate believers in human rights will know that protections are put in place to protect those with less power. To think that ex-pats from commonwealth countries are the ones in Bermuda with a power deficit is to ignore all that is true about colonialism. As a passionate believer in human rights I am utterly disgusted that the “human rights argument” is being appropriated for the OBA narrative. as a passionate believer in human rights, you should believe in HUMAN rights, not just in the rights of people like you. passionate believers in human rights don’t discriminate against others based on their skin color or where they were born or who their parents are or what their parents allegedly did (or didn’t do). Long long overdue. Well done. Bermuda’s population is shrinking. Bermuda’s population is aging. All developed countries have some form of immigration and pathway to residency and citizenship. This was sorely needed and long past due. We need to increase our “res pop” as Larry Burchall has so eloquently stated for many many years. As a Bermudian, I am proud of this decision. You can’t beat corporate…They own you…but don’t worry they’ll treat you humanely…but ya ain’t getting what they’ve got! The Minister admitted that the Govt would lose a court case if challenged under the Human rights act. Call me a cynic, but does announcing it now as a ‘humanitarian act’ just neatly bypass being told to do it by the courts? Afterall, why has it taken so long to announce this? As long as its majority of Europeans that are being granted, its goes along with his promise he made last year”It will be a long time before P.L.P get back in power”. Too bad some Bermudians are not as LOYAL as their white counterparts,who regardless makes no apologies voting for U.B.P. faithfully!!!!!!!!!!!!!!!! Your a f***ing dreamer bah! Go get that head checked before you spout more of your incessant racial hatred for white people! On top of that anyone who has a PARTNER overseas can bring them here to work when unemployment is on the rise, these Dreamers are using the same tactic that the Europeans used on the Indigenous people around the world during European Acquisition (only now its a little more civil and subtle. Indigenous you are not, the closest thing we have to indigenous in Bermuda is the European, who was here first. You do realize you’re a racist right? I know that’s an obvious statement but… I just want to get confirmation. Very fitting for living in a RACIST society. What a horrible racist line of thinking. Are you really in favour of keeping people out because you are afraid they won’t vote for your favourite racist politicians? A party that concerns itself with race, talks about race, measures things in terms of race, puts itself in a position to implement measures to address any racial inequity. A party that doesn’t is actually the one that is racist. Good for you, ONION JUICE. Thousands agree. Talk about raining on a parade, plus your boyfriend or girlfriend from overseas can come and work while unemployment is on the rise, the powder keg is just about full. Sounds like I struck a nerve, but we can see through the Bull S! @#, and those that voted for change are kicking themselves in the @$$. For all those who are going to weep and wail and gnash their teeth over this decision, I bet there are people you know in Bermuda who you assume are Bermudian but are not. I know some families where some children got status and other children did not because of the rather arbitrary dates that are currently used. 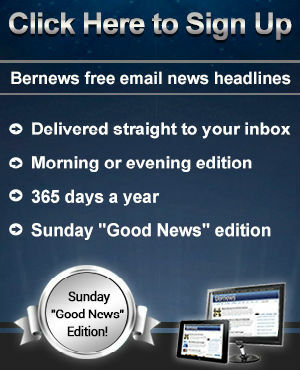 This is good for Bermuda and Bermudians. Jeremy, where were you when the UBP kicked out the Portuguese families in the 80′s? Guess it wasn’t a human rights issue back then. NOthing two edged about. Govt’s hand has been forced by the HRA – but that does not take away that for hundreds of people it offers an end to uncertainty. The HRA also did not exist in the 80s – perhaps it should have done? This is good for U.B.P. as most are European and a boost to their voting numbers plus the Surrogates. PLP had all the time in the world to court the PRC votes and chose to oppose them at every step of the way. So you are correct that PLP will get not one single vote from them or any of the new status Bermudians – and you only have yourselves to blame. Boo Hoo. I guess onions make you cry. That’s why Marc had to clean house, watch out for the next round. Clean house? I thought they left because it stunk. You’re logic only makes sense if you view politics through a racial lens….this country will only ever progress if we get rid of racists like you. Meh, I repeat, only whites have practiced racism in Bermuda based upon the historical record and considering its definition. Maybe the blacks that you get around (your one black friend) may let you get away with that stuff but I will not. That’s why majority of whites will ALWAYS vote for U.B.P. and rely on Black Surrogates and swing voters. And you would never get rid of people like me while we STILL have a RACIST society, even the Black actors and actresses who were denied being nominated in the Oscars realize that. Exactly what is it that has happened that allows us to stop viewing politics through a racial lens? The origin of the PLP is that after 350 years pernicious racial oppression black people formed a party for all working class families centred around labour values. Except for a brave handful, no whites joined the party. It was the white community that made politics racial and it has always been in their power to correct this. Let’s see, you lost at the polls last night & roll out with this the following morning. Not leaving the next election to chance I see. Yup. This is the most wicked government in all of Bermuda’s times. The FACT that their quiet, unannounced support is here without legal rights is unbelievable. The oba/ubp’s underhanded fashion in attempting to boost their voting power, COULD BACKFIRE. Too much sinisism, lies and wickedness are at work here. Because of those facts, they will fail!!!! Bet you any expat who has managed to stay here twenty years can spell cynicism however……. It’s all about votes for you, isn’t it? You don’t care about these people one bit. Bermuda does not need this kind of gutter politics. We need to pull together to survive now. The future will require much more from all of us. Actually this will probably have the exact opposite affect; this will cause them to lose more votes to all he closet xenophobes than they’ll gain through any new status persons. Having said that I applaud the decision as it’s the right thing to do. We need to focus on natural children of Bermudians as well. Too many have to jump through hoops for status when it is easier to apply to UK for status through lineage. They should not have to go that route to obtain what is inherently theirs through their parents. They need to remove the residency requirement for children of Bermudians. It should be automatic regardless of where you were born. We should follow or have laws similar to UK in regards to status. Azoreans born here in Bermuda can obtain status in the Azores based on their parents even if they never set foot there and most have Bermudian status because they were grandfathered in from 1985. Their children automatically have status. Why so long – let’s make it a year Mike. It is unconstitutional to treat one person different from another. Let’s give tourist citizenship also. Let’s go all the way man! More votes for the OBA. This will backfire .. In the future , all work permit holders will not be permitted to stay beyond a certain limited term . It will be rigidly enforced .. No discretionary favors granted . To those who are here already , welcome to paradise . Your precious PLP started this Coffee! You are so brain washed you can’t see that neither party has common sense to help Bermuda’s unemployed. Both help themselves and their own. You need some coffee to wake up and see the trees. In future all the work permit holders who the PLP kept approving permits for will now in time get status under the OBA. Their umpteen amount of children will be brought here and get status. The laws will become more lenient to benefit Bermuda’s new citizens and they will be able to bring their extended family. They will take more jobs from Bermudians and those that can afford to run will with their savings while those who can’t will sink into poverty. Financial assistance will increase along with the taxes until we can’t afford to call ourselves tax exempt anymore and ALL IB will leave because there will be cheaper places to go. Our dollar will devalue and we will have only wealthy and poor left. By this time the PLP and OBA members who started it all will have sucked Bermuda dry. We need UK to step in VERY SOON because there is no sound choice to govern now. PLP stuck in the sword and OBA is twisting it. So now, lets say you’ve been here 10 years already as a senior VP at one of these insurance companies…since there are no longer Term Limits, as a senior member of one of these companies all you have to do now is ride out another 5 years as you are almost guaranteed an extension on your work permit and from there you apply for your Permanent residency, then citizenship. THIS IS WHY WE NEED TOTAL IMMIGRATION REFORM. Actually, that Senior VP can already get a PRC RIGHT NOW under the Incentives for Job Makers Act 2011 which the PLP enacted. This legislation has no effect on that person. Whoop’s don’t hurt mixitup and havesomebackbone with the truth lmfao! YOU LOT ARE THE REAL SURROGATES!!!!! How do you suggest we tackle the economics of our steadily declining population? If you don’t understand how something works, why comment on it. Err….we don’t want “no furiners” and we don’t want “none of them others staying too long”…let’s all pay more taxes to cover the shortfall or better, let’s just grow more Bermudians on trees. Read the caps…Maybe an incentive to bring the thousands of Bermudians who have fled is a start..
even under the PLP an SVP would have been exempt from term limits. Usually after all them years, most in that position is ready to leave. Believe it or not. This comment is so xenophobic. If someone has been here for that length of time and contributed to the success of our country, why would we not REALLY WANT them to stay? By the way, have you noticed the trouble charities are in now that so many”work permit holders” have left? Talk about contributing to our society! It would be interesting to know the nationality and race of those now eligible for status. Before any of you accuse one of playing the race card it’s absolutely relevant in this instance as the vast majority (90 + percent) of white bermudians and residents were/are UBP/Oba supporters. The statistics would prove whether or not this is a blatant vote grab as many suspect to counter PLP gains before the next election. It is a vote grab. Pretty desperate one too following yesterday’s loss in C13. To better put things into perspective start with the fact that many white folks walking around here with status weren’t even born here. The OBA is the UBP and that is blatantly obvious now. From their leader to the underhanded approach they take to “whitening the voting base” as was done by their forefathers not that long ago. Yes same intent to marginalize the Black Bermudian vote, you have the Children of those who was brought here in the late 1960s early 1970 now forming policies. They are aware of their role. Well done OBA! Thank you! Has anybody read the book “Island Flames”? Wow. Day after a by election loss and they kick into full gear on operation expand voter base. What a bunch of snakes. Should be pretty obvious to you OBA supporters what your party is about and who they represent. When’s the last time anyone heard Fahy speak so compassionately about real Bermudians. His idea of victims are more likely to be folks that have thrived here on housing allowances rather than those who struggle to find work in their own country despite qualification. Get ready for the fall out folks. 1) “real Bermudians”? Wow. I suppose I am what you would call a real Bermudian but I find the distinction tedious and divisive and, frankly, sometimes quit arbitrary. My baby daughter was born abroad and is eligible for status now. My Bermudian friend’s child was also born away and he has to wait until he is 18. 2) I think this policy was being crafted for a long time. Not a knee jerk reaction to the by election loss. 3) I think you are underestimating the number of black potential Bermudians under this reform. There are many Bajans, Jamaicans, Trinnies, and people from St Kitts here as long term residents or children immigrants. Another issue where there is much ado over very little at all. Moving on, in other news, a business wants a convenient carpark for customers. * Make it easier to raise a child by providing free Pre-K day care. * Better schools for kids to attend! Allow Bermudians anywhere to have a child with a person from anywhere and that child immediately becomes a Bermudian upon birth. If you want to have a growing population you must have more people under the age of 18…KIDS! It is kids that boost the economy as they require more resources as they age each year…this is know as GROWTH!! A 30 yr old clerk from Canada does not have to spend more each year to live!Our government is brain dead!! Mate, read your comment again. You will then realize why you are not a politician because your ideas are absolute crud. Public school here is very poor (sorry but the truth hurts), free food won’t do anything besides raise costs (what income will cover this? ), yay, more youngsters having children who will be gaining a poor education when they grow old and eventually grow up to be a useless generation who will need endless benefits due to a failed overall system. Probably 5% of the generation smokes cigarettes (doesn’t do anything besides raise healthcare, but then again 75% of this island is overweight, so what is the real issue?). Only useful thing you have said is improve schools. What good is a better school if students aren’t motivated to do better in life? School relies on two things, the amount of knowledge taught and the effort of a student to learn. Let politicians do their job, you stick to what you know. Well done for this sensible move forward! Bermuda needs more people not less and those that have contributed to the country for 10, 15 or 20 years plus SHOULD be given status. Bermuda is finally adjusting its policies so that they are more in line with the rest of the developed world! I look forward to seeing a more multi-cultural, equitable and vibrant society developing as a resullt of this brave step which in the end will be better for everyone! I am one of those who would be affected by this. First some history. Nearly 18 years ago (Feb 16, 1998) I first came to the island on an invite for an job in information technology. I had been working in the field professionally for 8-9 years prior to that. I was well qualified. Obviously I fell in love with Bermuda at first sight and realized right away that I could really enjoy working here a while. I never expected to be here more than a few years if that upon arrival. Beyond the beauty of the island however, I was even more taken by its wonderful people. Bermudians, as a whole, I found to be the most hospitable, kindest, polite, good natured, good humored, and all around the most wonderful people I’ve ever been around. I have always been much the same sort of soul and so I honestly found myself fitting in quite well and acclimating quite quickly taking to culture swiftly and easily. Bermuda has given me so much! I also matured as a person here so much by example of my Bermudian friends. Over the years I have tried to show my appreciation for that Bermudian acceptance and hospitality in all the small ways I could. Ive given to charity both organized and unorganized as much as Ive been able. Ive come to work each day over the last 18 years doing the best job I possibly can being nothing but 100% faithful to the employer (persons) who brought me to this wonderful place for the honored privilege and appreciation of another years work permit. It has never escaped my mind once over the last 18 years that I am absolutely not more than a guest here in Bermuda and Bermudians are my wonderful perfect hosts. I have NEVER once held any opinion publicly or privately on any political matter because I am not a Bermudian and thus opinions of such a nature were not my business in my mind but for those who are citizens of this wonderful island. (Not that Im of a very political minded nature to begin with, mind you). I have always known that any year given it could be my last year and it would be time to move on from the only home Ive known in 18 years. The longest in my life that I have ever lived in any single location to date. At a moment it all could pass and I would have to say good bye to the relationships, way of life and such wonderful friends I have in my life in a moments notice. I have always accepted this as a simple fact of life of being here and as simply the price I pay to be here. Since I never have known year to year if its my last year (even tho its been 18 now…it goes by so fast when you are happy!) Ive never bought a car (tho I would like to), Ive never really made any “major” purchases that would be difficult to sell or move. Believe it or not I even STILL have suitcases packed with belonging and clothing in my closet from 18 years ago I’ve never unpacked! I dont know where the time goes. Being able to apply for PRC (and eventually status) would be nothing to me more than the greatest PRIVILEGE and honestly most humbling moment of my entire life. To be fully accepted by a community and country I have loved so much would be beyond description to me. Being able to say “I am a Bermudian”, to me, would be the not only the highlight of my life but the greatest honor I could ever receive and I would say it with nothing but great pride for my entire life. I have never once expected the privilege. I have never asked for the privilege. I have always fully accepted the fact that when it was my time to go “it was my time to go”. That said, should it be offered I would accept with humility and immense gratitude the honor of that privilege to be able to call myself your brother Bermudian. I understand some of the concerns here but honestly Im nearly moved to tears on just reading today of the prospect of a dream come true. I promise I wouldn’t let any of you down ever should I be accepted as a permanent resident or someday citizen. I’d like to add one thing to those with concerns/fears about this issue. Suddenly having PRC or status isn’t going to make me suddenly feel like Im on equal footing with Bermudians who are naturalized as such and been here since birth. In the back of my mind I will always know that Im still a guest. An accepted one but still a guest. Thats all really. It will just allow me to feel like not only do I belong but that I don’t have to worry any longer year to year and lose sleep over the fact that in a moments notice on a whim I could lose every friend I have and my residence and my belongings. And that’s somehow suppose to make the guy that’s worked just as hard as you, perhaps in the same role, feel better about the fact you have a better chance of buying the home he wants in HIS country after you’ve had the luxury of thriving on a housing allowance and whatever other corporate perks that weren’t afforded to your local counter part? Of course Ian because Mike Fahy says your not entitled they are. Maybe you should try and get a job in their country and when they tell you citizens first ask Mike to come and explain his reverse logic to them. I doubt it will help but maybe after they laugh in his face he can call them xenophobic. They will probably then explain to him that it’s not xenophobia its the law to protect their citizens from becoming impoverished in their own country and in turn making their country into a welfare state. What Future Bermy? doesn’t understand is that if Bermuda keeps going the way it does he probably be better of finding a job in Jamaica since all will be the same except he’ll have a warmer winter. So much misdirected self hate, here is someone who has made this his home and worked for it, do you realize that there are people that get the right to vote after 18 years who have done nothing to deserve that right, who have yet to contribute for that right. As for the hypothetical local having work in the same role feeling disadvantaged in the housing market, if that local hasn’t sought to invest into owning a part of the rock, how is that Future Bermy’s fault. You do know there are some locals that do get corporate perks from their jobs, even housing subsidies… it is all about first showing your worth to the company, then negotiating for better contract when it is time to. I was raised on the principles that you aren’t entitled to something, that you earn what you have, and that it your responsibility to pass that on, because only when you have earned something, do you understand it value, you never will if you think you are entitled to it. Be honest then….what jobs that “foreigners” currently hold do “real Bermudians” want to have like you say? Just answer truthfully! As far as um concerned the guys on the trash trucks make plenty more money than people that work at Buzz do! i have never had any housing allowances or what the hell other perks you talking about in my entire life and I cant imagine I could ever afford a home either. wtf perks and crap are you talking about seriously. I cant afford no houses cousin lol. what the hell you on or worried about? 18 YEARS! WOW! Since your so you love Bermuda and Bermudians so much why don’t you talk to your employer the next time your permit is up and get them to hire a Bermudian. Maybe you should convince them to put up the job offer longer than the minimal minimum of 8 days so that Bermudians who can do your job have more of a chance to see the offer. LMAWO! Let me break out my mini violin. Sadly to say what you feel and what is are two different things. Unlike other jurisdiction who have protections in place you will with status be on the same footing as a Bermudian. Only ties you have to Bermuda are your belongings that you can sell off and your friends that you can keep in contact with on skype. There are spouses of Bermudians who have lost their job unfairly to permit holders. SPOUSES who are already supposed to be on the same footing as a Bermudians but it just goes to show what footings Bermudians have in their own country. SPOUSES that had to take their children to a country they did not grow up in and you are worried about the friends you will lose as an adult. You and Mike Fahy need to grow the hell up because you think there is not one Bermudian who is entitled but now you both feel you should be. I bet in the country you came from a Bermudian with your qualification would not be able to take your place and I bet the country your from has far more jobs and far more room and resources than Bermuda. What are you a child?!?!?! Did you not know as a permit worker you are supposed to be temporary? Didn’t knowing you were temporary deter you from working in Bermuda like Fahy insinuates? Of course it didn’t because it’s never been a deterrence to anyone offered a position in paradise even short term one. There are few people on the planet that can do what I do. I would be more than happy to teach someone else objective c++ and sql server coding. Would you like to learn? Are you Bermudian? We would hire you in a moment to do GP extender dexterity coding. Can you handle that from day one? I also f**** wrote the socket routines for TCP/IP which allows morons like to you write condescending messages to me on the internet. Can you do that too? I do not feel “entitled” to anything an I never have in 18 years. Again, your argument is irrelevant as there honestly are not many on the entire planet that do what I do for a living. You might have wanted to ask taht before your irrational rant. I am pretty sure I got across in my original posting that I always knew full well that I was temporary. If you think this is “paradise” I have news for you lol. Bermuda is lovely but far from “paradise”. That does not deter my feelings on the people who live here however. I didn’t resort to name calling but since you insist on calling the person you can’t see on the other end a moron you should first gain an understanding of what it is to be condescending. You claiming to be one of the few on the entire planet to know how to write the coding you mentioned. Honestly there are many on the planet who can do what you do but hey no one can stop you from being your own biggest fan. If you were that sharp you would be working for Larry Ellison and would have made more than enough to afford a house in Bermuda but obviously your not. Heck there are content management systems that can do what you do with basic operations knowledge. Soon with the way automation is going you will be a dinosaur. You are full of it claiming you wrote socket routines for TCP/IP. The guy who wrote that is a 77 year old Jewish American which I highly doubt is you. There are Bermudian Devry graduates who can do what you do. There are even online course graduates that can do what you do. Dang! There’s even you tube tutorials that can teach people to do what you do. Even this site is on a open source CMS that the owner of it has used so they don’t have to pay a dinosaur like you to create. Bermuda is a paradise and you putting down my home and the home of my ancestors who have worked so hard to build up makes me realize you don’t deserve to live in it. You are a living hypocrisy saying you don’t feel entitled and then proceed to toot your own horn claiming to be Bob Kahn. Are you sure you wouldn’t rather become a comedian because you are hilarious. Hate to inform you smarta–! But we are no longer paradise. With all this bs shootings and robbings. Paradise!!! Lmao. Go figure dude. You got a hate problem btw. Get a life. As a Bermudian, I honestly swear to God. We must be some of the most selfish, self centered none caring peoplein the world. Bermudians are not very giving in this area. As long as its foreigners coming here to live its a massive problem. To live there and receive status its very big. We all know it. How many folks run to England and try to get accepted? Everyone and their mommy!!!! Lmfao. So than we try to get on their welfare plan! Free housing! Government assistance! Tax assistance medical plan.!! But as soon as a foreigner attempts to get status we treat them like hated criminals. guys are b—Ging!!! Go away Puuleasse. We don t want you back. If PLP was STILL IN POWER CAN YOU IMAGING. I DO NOT WANT TO EVEN THINK ABOUT IT. This island will be totally done. Our money will be worth nothing. You must have flunked out of socials studies? Huh? It must have been the lesson in population density and natural resources that did your head in. Hey! If you want Bermudians to be more caring lets adopt a few thousand Syrian Refugees. It’s not about foreigners attempting to get status it’s about government changing laws that will allow every permit holder to get status. There are thousands of permit holders who have had their permits passed over and over again. It’s one thing to give PRCs status and another to allow the majority of permit holders to become PRCs. Work permits and residence allowances like the green card do not guaranteed permanent residence to their holders while our PRC is. A green card and permits can be revoked. TO ERM: Bring your thoughts to the present tense.The issue of ex-pats is CURRENT, REAL, FOOLISHNESS and cuts into the lives of REAL BERMUDIANS.What is going on currently, could have YOU BARKING in the end. Bad deeds will be punished. Sadly not all of us expats qualify to move back to where our ancestors came from so some of us are stuck unlike the present expats. If we tried to move somewhere else we would have to go through the same paperwork and procedures as the expats here and we would not be guaranteed permanent residence even if allowed to stay as a guest. Funny how that goes in such massive countries but on our tiny island we chose to ignore those facts and think it’s so much different because Mike Fahy says so. Unless it’s in UK or the Europe – no paperwork for you. You are so true, so how do you explain America and Canada. If there are supposedly jobs for BERMUDIANS on line NOW, BRINGING IN more bigots is CRAZY!! What type of a government looks out for its own interests and leaves its OWN behind……….This CRAZY PLAN of the oba/ubp will fail!! Human beings’ lives are at stake. They haven’t even considered who they destroy. The plan will backfire and create HAVOC in the oba/ubp oligarchic ranks.Then, Bermuda will be in RUINS!!! This social recipe by Fahy and others in the oba will lead to Civil Disobedience. One thing i don’t understand. Bermuda requires scarce skills and investment from foreigners which by the way help greatly in funding govt programmes such as social welfare which is exclusive to bermudians, but don’t want to accept a pathway for foreigners t permanent residency. So why cant Bermuda disassociate itself from UK, pass a law to appoint bermudians to these skilled professions and just run their own country.How can it be that you like someone s scarce skill and their business but you hate them. The problem is that most of the protesters are people who are being used by politicians seeking publicity without understanding how the economy works. The world has changed , its time this island adhered to world expectations and desist from segregation. The Big Lie. OK here’s the myth. The small group of people here, who try to galvanize the masses for PLP votes, rely on racial hatred as their only tool. They figure that if they can get most “black” people to hate “white” people, and blame them for all of society’s ills, that they can gain the votes they need to return to power. (And throw us into even deeper debt than they did the last time, which must have been a world record!) The lie is, that if you let “other” people here, they will take all your jobs. The truth is: Take them all away and there won’t BE any jobs for you. You see, jobs depend on an economy. We need to get money from somewhere. It doesn’t grow on trees. So stop trying to fool the disgruntled into thinking that kicking out expats will give them an easier time. You don’t care about any of these people. You are just trying to stimulate anger that you can turn into votes, for your own greedy ends. We see through you. Stop it. This pathway still falls way short of international immigration standards. 15 years for permanent residency ? At least its a starting point. Now why are bermudians worried about this development when they can easily go and live in England and also qualify to work easily in the EU, and we know that after a few years they qualify for residency in Europe. Am actually surprised this unfair treatment of long time bermuda expats went on for years without human Rights Commission taking the previous governments to task. Its grossly unfair that after working to build and improve an economy for over 10 years, paying taxes and all related to government revenue collection, one gets “kicked out”of the island with nothing.Bermuda is also lucky that a lot of expats are hardworking and great people with skills unlike other countries who receive an influx of refugees against their will.